You may have seen me restyle a shopper bag in – this post. Not meaning to be ungrateful for freebie cloth shopper bags but they are usually emblazoned with the generous companies logo and or product. I prefer to be a little low key on that score. Since I am 99% vegan. And yoga loving. A Kale shopper bag would be just perfect for me. Not so easy to find. 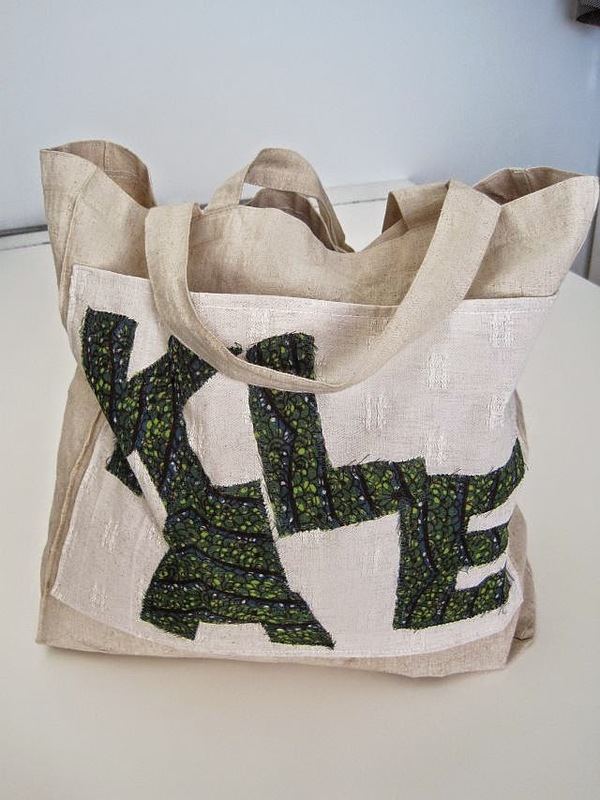 This sturdy hemp shopper was ideal for a Kale makeover. You have to create a side pocket – or one on each side – which only makes it even handier. Space for shopping lists, mobile phone, pens, business card holder or scooter keys. You could make a Love bag or a Time Out bag. Pick any word/s that you resonate with or want to embrace. Just know less is more. You have to sew them on. Find craft letters on the Internet. Print them. Cut them out. I didn’t cut the middle out my A because it was easier not to. Pin the letters to your contrast coloured fabric and cut them out. Now cut out your pocket. It needs to fit on the side of your bag with enough space all around for a hem on top and a seam allowance on the bottom and sides. Pin and sew letters to pocket. I used a zig-zag stitch all round. It’s a bit tricky when there are sharp corners or turns. Now hem straight across the top of your pocket. Then turn ends in all around and pin the pocket to your bag. Sew pocket to your bag. And just like that your super cool Kale shopper bag is done! Head to your local farmers market and fill with organic goodies. P.S, Google+ and GMail are marvelous. I get comments and feedback from people on the other side of the planet with suggestions and shortcomings. Those of you who have asked for updates, I will get to them soon. Promise. I know my Gallery is not great on smaller devices and desperately needs to be sorted. I have to get the hang of Bootstrap. Meanwhile for those who are at a desktop or laptop, my three Galleries have pics of DIYs going back three years. Hopefully you will find something to inspire you to DIY and not buy.